Israel's Haim Shimonovich and Canada's Phil Martin may be among the more familiar international names on UH sports rosters, but the hoopsters are hardly alone. Nearly 1 in 5 athletes who don Manoa green or Hilo red are international students. In fact, only 2 of 20 spring teams are all American in a literal sense. Athletes from 19 countries on 6 continents join U.S. teammates in spring competition. They come from near (Tahiti golfer Manaril Gauthier) and far (South African basketball forward Paul Jesinskis). Canada has the heaviest representation with 23 athletes on 11 teams, including Rainbow baseball catcher and snowboarding aficionado Steve Bell-Irving, NIC diver of the year Mike Gowdy and volleyball outside hitter Matt Carere. Australian athletes hold 16 spots on 8 teams. Wahine basketball players Bryony Crouch and Jade Abele (a two-time WAC scholar-athlete), diver and former junior trampoline world champion Maggie Roberts and softball pitcher Paula Blanning and pinch hitter Stacey Ritter all hail from down under. Sweden is third with 4 players on 3 teams—Vulcan tennis brothers Karl and Staffan Moritz and the Wahines’ Swedish National Team golfer Sara Odelius and Swedish junior team swimmer Mia Broden. Brazil and Japan contribute 3 athletes each, including popular Warrior volleyball player Pedro Azenha, Pakistani born Manoa sailor Lena Mobin and Hilo tennis players Mai Fujii and Michiko Tanaka. Tennis is the most international sport at UH. 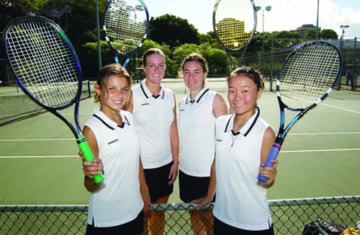 The ratio of athletes from abroad is 57 percent for Hilo women (add France’s Dorothee Beauvir and Estelle Vicquenault), 50 percent for the Vulcan men and 40 percent for the Wahine. Five of 12 Manoa men’s golf teammates cut their first divots on foreign links. Wahine track has the deepest international roster at 12—including 11 runners who followed their coach across the Pacific from Canada. Manoa men’s and women’s swimming/diving teams have 7 international athletes a piece. The men’s swim team also boasts the most diverse draw, including Germany’s Kurt Boehm (a UH record holder), Israel’s Nimrod Palma, Romania’s Tudor Ignat and Spain’s Hugo Duran. The women’s team adds China to the mix with former national champion YingJuan Zhen and former world record holder Yan Chen. The basketball ’Bows represent 5 foreign nations, with Yugoslav center Milos Zivanovic and Lithuanian guard Vaidotas Peciukas joining Martin, Shimonovich and Jesinskis. Hosting athletes from 4 coutries are Manoa men’s golf (including New Caledonian marine biology major Pierre-Henri Soero and British Columbia business major Jordan Belton) and Hilo men’s tennis (Austrian economics major Richard Korneck). In short, while Manoa Athletic Director Herman Frazier may be part of the Olympic’s United States Committee, at home he and Hilo counterpart Kathleen McNally represent the world.